Is Benny Feilhaber The Most Underrated Yank? Seemingly lost in the conversation about the national team is Benny Feilhaber. Most see him playing a reserve role for the Nats come World Cup time. But in my view Feilhaber should be central to Bradley’s plans. As this World Cup cycle began, Feilhaber looked certain to be a pivotal figure for the national team. He was playing in the Bundesliga for Hamburg – he even played in the champions league – but his move to the Premier League to Derby County backfired. Derby County was the laughing stock of the Premier League, the manager that brought him in got fired, and Feilhaber proved to be a luxury that a struggling bottom feeder couldn’t afford, choosing to go with more combative and defensive central midfielders. That experience at Derby and a couple of injuries saw a pause in Feilhaber national team progression – he basically fell off the map. However, he landed at Aarhus in Denmark and reemerged with the national team in the Confederations Cup. Feilhaber has had another solid year in Denmark, leading to interest from La Liga sides over the winter. Feilhaber offers something that other central midfield options just don’t have to the same degree – poise on the ball and precision passing. Feilhaber is not as adept defensively as many of the other options, therefore playing him alongside Bradley – another player who likes to get forward – leaves us a bit vulnerable as occasionally both players get caught too far up field, allowing the opposition to counter. However, international football is very much about possessing the ball and that is Benny’s strong suit. He is also a creative force. He has an ability to pin point through balls from deep – think penalties won by Altidore in confed cup against Italy and by Eddie Johnson in Copa America against Argentina. He also moves well with the ball and with some tidy footwork he put Donovan through on the second goals against Spain. 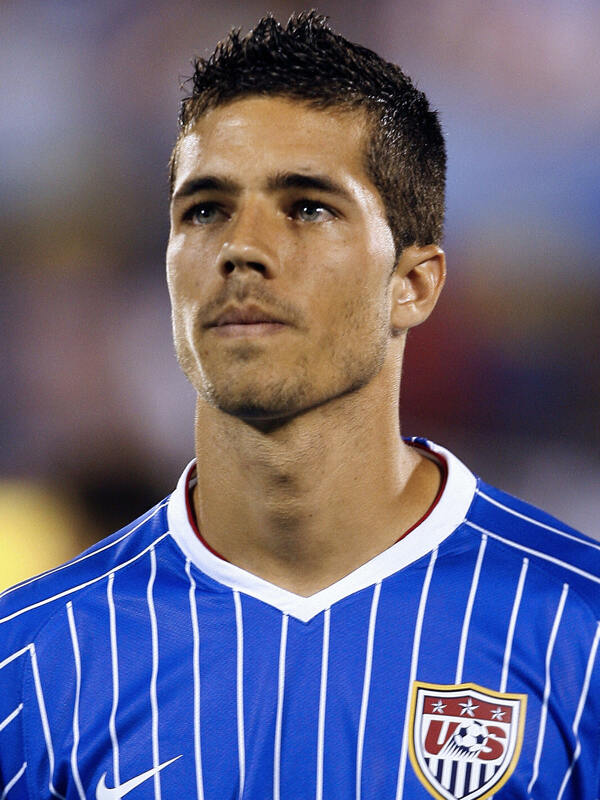 In general Feilhaber is as close to a #10 that the US has. And we all know he can hit the ball. Another possible #10 option would be Jose Francisco Torres or Stuart Holden. Both are solid players and Bradley gave Torres a run out in the central midfield against Holland. But for my money Feilhaber’s experience and his skill on the ball offer something a bit different. Now we know that Michael Bradley is an automatic selection. Bradley however has some weaknesses he has a great engine, defends well, and can get forward effectively, but is not the best distributer. Ricardo Clarke and Maurice Edu are traditional holding players, but aren’t great at holding on to the ball. I think it’s likely that one of these two start with Bradley against England. But against Algeria and Slovenia there is no reason to pull a Liverpool and play an overly defensive formation against these teams – against them it is about getting goals. But Feilhaber is also a versatile player who can play centrally or out wide, as he does in Denmark. While we wait expectantly on Davies and Holden (while it looks like he will be back, leg breaks can be tricky), Feilhaber is definitely an option to start. While he suffered an ankle injury, it looks like he should be back in action by the end of this month, giving him plenty of time to regain form and fitness. One could envision a lineup similar to the one deployed against Italy in the Confederations Cup, which was effectively a 4-2-3-1, with Bradley and Clark holding, Feilhaber playing in the middle of the three with Dempsey and Donovan wide and Jozy up top. This lineup went toe-to-toe against Italy until Clark’s red card. I think if Davies or Holden are still not fit, Feilhaber would do well either as part of the 2 central holding midfielders or as the center of the three. While it may seem bizarre to play Feilhaber further back, this would be akin to the Pirlo role for AC Milan, where he plays along side two other holding players. This would also allow Bradley and Feilhaber to play inter-changeably and allow Bradley to assert defensive pressure higher up the field. Regardless how he is used, in my view Bradley should find a way to get Benny on the field. The main problem is Benny almost never gets a chance to play his true position, mainly because it doesn’t exist in our current formation/tactics. He is a pure # 10, plain and simple (albeit one that would ideally like to drop back deep for the ball, a la Arteta or Sneijder)..
Dempsey clearly does well close to goal and puts himself there anyways so we might as well start him there. Donovan and Altidore would not only work well as wing forwards, but, if the team severely needs it, they are willing to help defensively. Dempsey also wouldn’t just sit up top and act like a target; he’d float around the attacking third and look for spaces in which to operate. That means the defense will either chase after him, leaving an open space for someone to use, or let him run and risk him doing something dangerous, i.e., Fulham – Juventus. Feilhaber is the number ten who still likes to help defensively, which is great for the USA. Edu is the defensive anchor who is still skillful, and Bradley will help both. It’s a pretty good formation in my opinion. Who knows, maybe it could be used someday. SO true about Benny. He is by far the best player the US has right now. He reminds me a lot of Tab Ramos and the fact that he plays so little is odd!